Tired of big clunky footwear? Want something that is lightweight and extremely breathable but holds up to the wear and tear of many miles on the trail? Check out the Bedrock sandal. The company is based out of Richmond, California and the sandals are made to order. Yes, that’s right. The sandal you order today takes 2 to 5 days to produce depending on how busy they are. The company was started as a Kickstarter campaign in 2011 and has grown slowly over the past 6 years. Bedrock is also a proud supporter of the 1% for the Planet program. The sandals themselves? The foundation of the Bedrock sandal is a Vibram sole. The Cairn and Cairn Pro models use a specifically designed tread pattern with the difference being that the Pro uses Vibram Mega Grip rubber. These sandals are said to last at least 500 miles and some users can squeeze 1000 miles out of a pair. Once you walk the soles off the sandal, take advantage of Bedrock’s Resole program. Starting at $60 you can get a new rubber sole put on. If the dog chews through the straps they also have a re-strapping service. Want a little more cushion and even some minimal arch support? Try the new (2018) Cairn 3D. The same strap and sole that we love with the original Cairn but less intimidating to the non-minimalist buyer. In relation to the classic Chaco sandals, the Bedrocks will be much lighter weight with a vastly lower profile. Where the Chaco has a very supportive arch and heel cup, the Bedrock will not. It’s literally a flat sole with nylon straps. As far as durability goes Bedrock and Chaco are comparable. Because of the pure thickness of the Chaco sole, it will put in a few more miles before needing to be re-soled. The strap configuration on Chaco sandals is unique in the way it’s run through the sole. When first trying a pair on this can be a bit frustrating. Bedrocks have a very simple thong styled strapping system. Compared to the Teva Universal, the Bedrock will be of similar weight, though constructed with much burlier materials. The Universal is known for being soft and providing a little bit of arch support. Durability of the Bedrocks will be far greater than the Universals. This boils down to the quality of materials and construction. This is reflected in the price without much surprise. 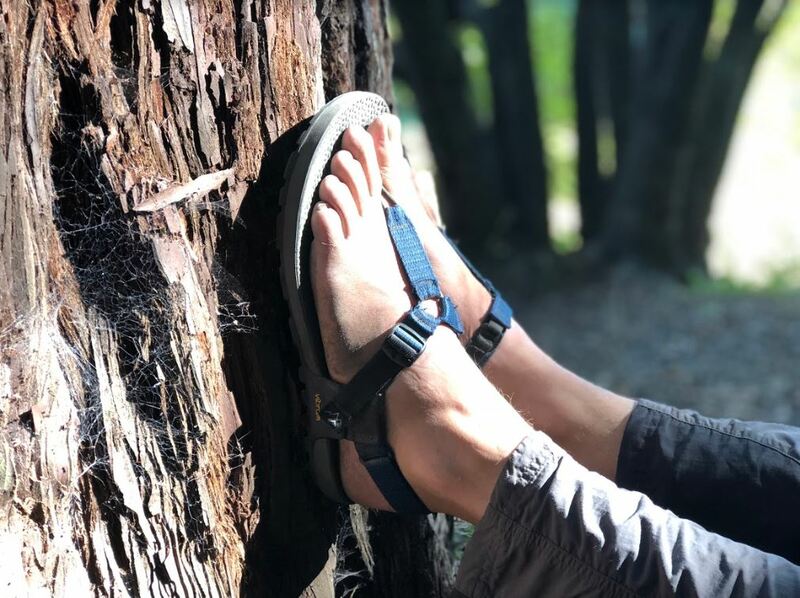 The Bedrock Cairn is a hardwearing minimalist sandal meant for use anywhere your feet can take you (notable exceptions being possibly the arctic, winter alpine ascents, and the occasional wildly overgrown and thorny trail in West Virginia). What makes Bedrock standout to me is how simple they are. With no support to speak of and a secure strap it’s a throwback to some of the earliest footwear designs that we created as a species. Only what you need and nothing you don’t. With this being said, it will take some time to get your feet used to not having their normal rigid entrapment around them. After a few weeks of regular use, the muscles in your feet will get used to being free and having the ability to naturally splay out. This will strengthen those muscles that most people don’t know they have. Brandon– I’ve been wearing the Bedrock Cairn sandal since April and have put about 500 miles on them so far. From hiking and backpacking to kayaking and running they treat my feet well no matter where I’m at. If you’re looking for a good water shoe or something to run around the desert or other rocky environments, the Vibram sole provides a ton of traction. If you’re not used to minimalist footwear they take some getting used to so take it easy at first. Bryan– I have been a die hard of the minimalist footwear for over ten years now so there was no break in period for me. They have been my go to day in and day out for two years now (winter excluded) on trail, water, or town. It is refreshing to see a company do everything so right, from manufacturing, to distribution, to function, and accountability. The heavy arch pushing sandal never worked for me so I’m happy to have my solution. Will- I used to wear closed-toed shoes every day of the year until I discovered the Bedrocks, and since then the Cairns have been my everyday shoe. I’ve always thought the key to standing 10 hours a day at work was a shoe with a lot of support, but I’ve since discovered my feet are actually most comfortable in the opposite- a shoe like the Cairn without support is the only shoe I’ve found that won’t leave my feet sore by the end of the day. I have endless praise for the Bedrocks and they would be a great multipurpose shoe. Olivia– I love my Bedrock sandals. They are the most comfortable sandals, really shoes in general, that I have ever worn. I have severe bunions and finding footwear that fits them comfortably with my active lifestyle has been difficult. The Cairn sandal bridged that summer gap for me. I hike, backpack, bike, run, swim, play tennis, and casually wear these shoes in my everyday life. They have held up beautifully to my abuse and my feet thank them. Only suggestion, try them on before you purchase, they run about a size smaller than normal shoe sizing. RRT stocks a full size run for Men and Women in both the Cairn and Cairn 3D in multiple colors. Unfortunately these are not listed on our online inventory so please call for availability or stop by to try them on!